Have you seen those cooking shows where the famous chef is cooking at home on their day off? I"m currently obsessed with Alex Guarnaschelli. Her show, Alex's Day Off is thirty, tip-filled minutes with simple instructions for a great meal. The one I recently viewed was for a roasted chicken. And as luck would have it, I happened to have a nice fat organic roaster, just waiting for some love. 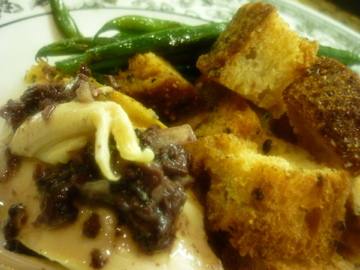 This recipe included a homemade olive tapenade.... just a little more love to slather... Even if you're not a fan of black olives, make the tapenade. It's all about the flavor... Trust me. 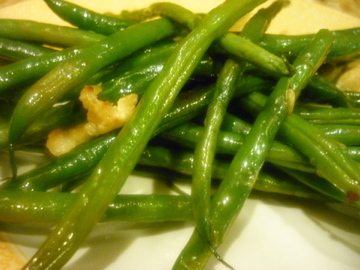 While the bird roasted, I blanched a few green beans to serve on the side. Then, right before time to eat, I sauteed them with garlic and sprinkled them with a pinch of kosher salt and a liberal amount of freshly ground black pepper. 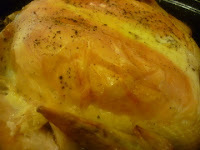 The crispy, golden-skinned bird made a grand exit from the oven. After cutting into serving pieces, I arranged a few pieces of lemon and the olives around the meat. 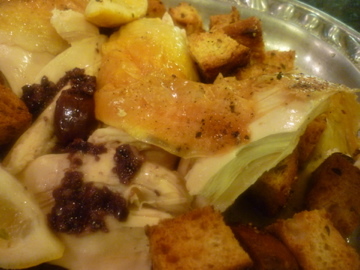 The big, garlic croutons were tossed onto the large pewter platter beside the chicken. The stock and pan drippings were drizzled over them. They became a heavenly pile of crispy-soggy stuffing. Sometimes I amaze even myself... at how well I can follow someone else's instruction, anyway. The tapenade was the kicker. It elevated the existing flavors to a whole new level. I am sharing my version of Alex's recipe. I cut out a few things. If you want to see hers, click here. The stuffing idea was strictly mine. I had chicken stock and drippings. I had giant, homemade croutons. 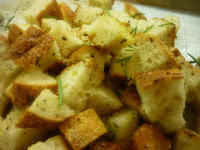 There was no other choice, but to make stuffing;) For the crouton recipe, click on the above highlighted link. this is one of the BEST things I've eaten! Season the inside cavity with salt and pepper. Arrange the chicken, breast side up, in a roaster with a lid. Zest the lemons. 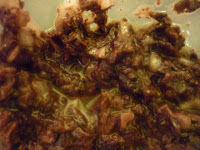 Mix with butter and a couple of pinches of salt. Cut the zested lemons in half and put it inside the cavity of the bird along with the thyme, and the extra olives. Rub butter-lemon zest mixture on the outside of the chicken. Roast in the oven for about an hour, remove lid and brown for another ten minutes. (The juices from the thickest part of the thigh should run clear. 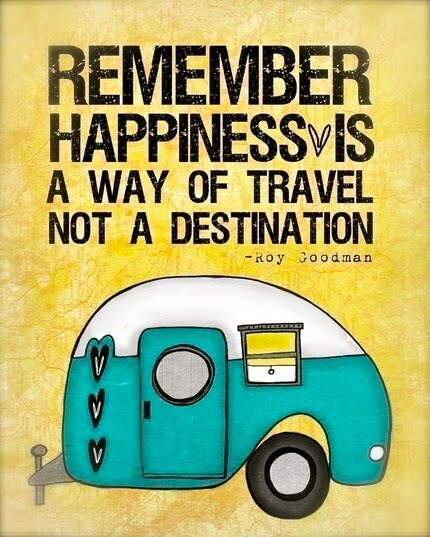 if they're not, throw her back in for a few.) Remove the chicken from the oven and allow it to rest about fifteen minutes. Cut into serving pieces. Place the shallots and olives in the bowl of a food processor. Pulse until finely chopped. Add the whiskey and with the machine running, pour in 1/4 cup of the olive oil in a slow stream. Taste for seasoning and set aside. 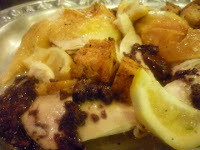 Arrange cut-up chicken, lemons and olives on a platter. Drizzle any run off juices onto the chicken and croutons. Toss the croutons a little to distribute juices. Top chicken with a little tapenade and serve immediately.